Last summer Hookedblog spent some time exploring the French capital, from coffee spots, galleries, local hangouts and of course some of the street art and murals across the city. 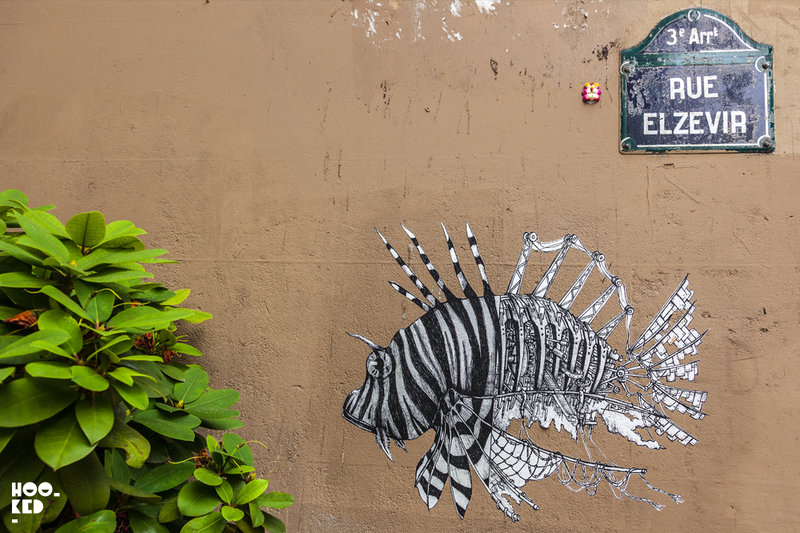 We always enjoy returning to Paris, especially over the summer months trying to avoid using the subway where possible, preferring to walk or using one of the many rental bikes while out street art hunting! While cycling around central Paris it wasn’t long before we were stopping to photograph some street art, unlike cities such as London were you find pockets of street art in certain neighbourhoods or streets, Paris is a city were you tend to find street artworks just about everywhere as you are never far from an Invader mosaic piece in the city you just need to look up! Stencils, stickers, one-off paste-ups (which are still really popular with the French street artists) and not forgetting the large-scale murals it didnt take us long to fill up the 16GB memory card in our camera! One work that caught our attention was a black and white pasteup on Rue Elzevir pasted halfway up a wall. 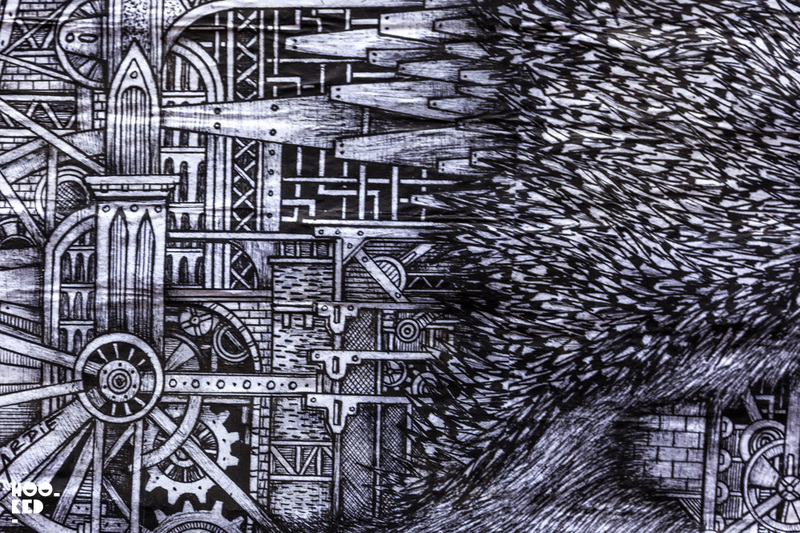 At first glance, we thought it the work of another French street artist who is based in London, but crossing over to take a photo and seeing the mechanical detailed elements in the piece we realized it was the work of another artist, one whose work or name we were not familiar with. We photographed the piece and shared to our Hookedblog Instagram account later that day while taking a break in the wonderful canal side cafe, Pavillon des Canaux (great location / coffee/ cakes/salads and probably the most Instagram friendly place we have ever visited!!). 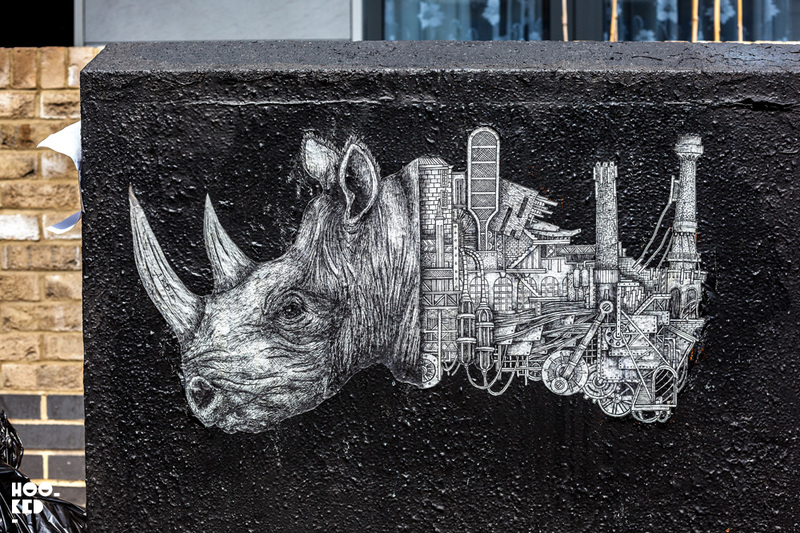 We asked our followers if anyone recognised the work and was able to help us identify the artist, it wasn’t long before one of the global street art enthusiasts that follow us recognized the work and were directing us to the Instagram account of street artist Ardif who had created the paste-up. It turns out the street artist is based in Paris and we hoped we would catch some more of Ardif’s work over the following days in Paris but unfortunately, the one pictured up top was the only piece we discovered. 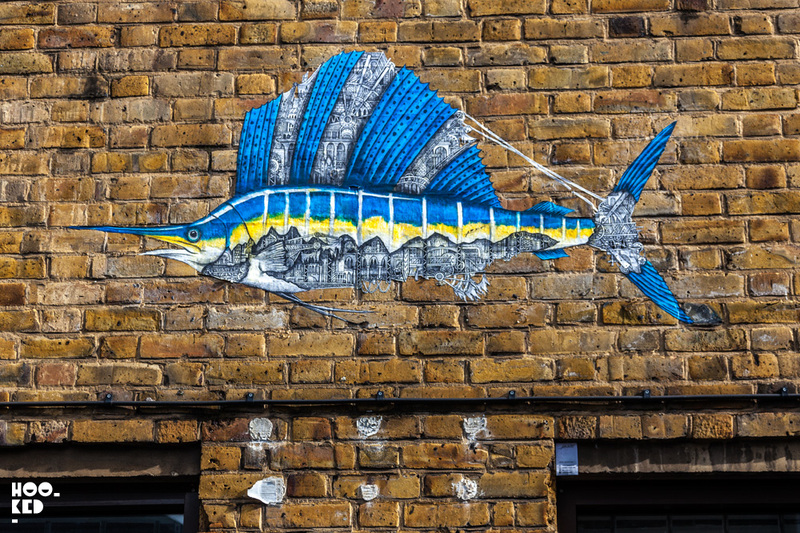 It would be a whole year before we photographed the artists work again, but on this occasion the artists ornate mechanimals paste-ups were on the streets of East London. The artist it would appear passed through London installing a whole series of works mostly black and white with one colour piece in the Star Yard car park off Brick Lane. Pictured below are the pieces we have traced down to date, there are still one or two we know we have missed so if you know the locations please do share them with us. 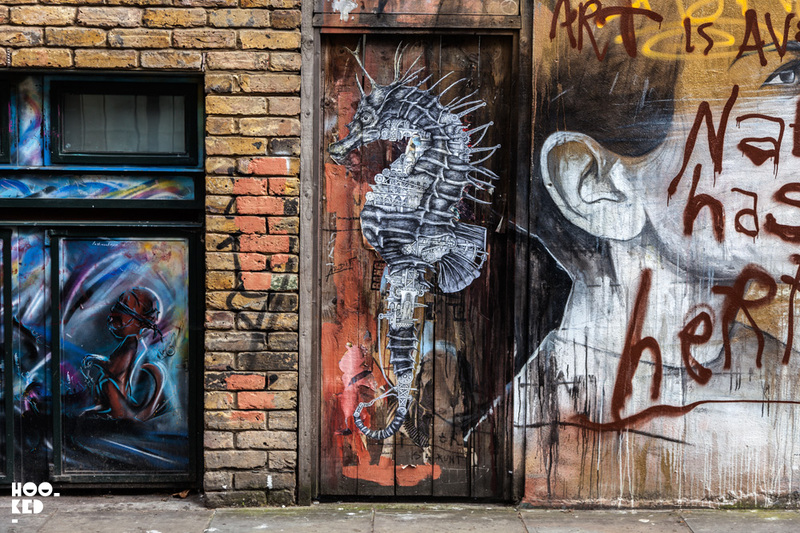 "Brick Lane Seahorse" on Heneage Street, London by artist Ardif. 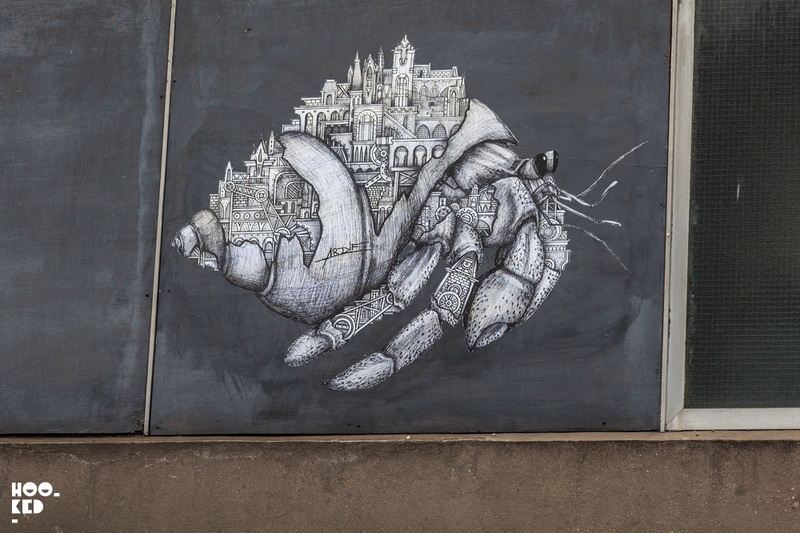 Hermit Crab Mechanimal by Street Artist Ardif located on Brick Lane. 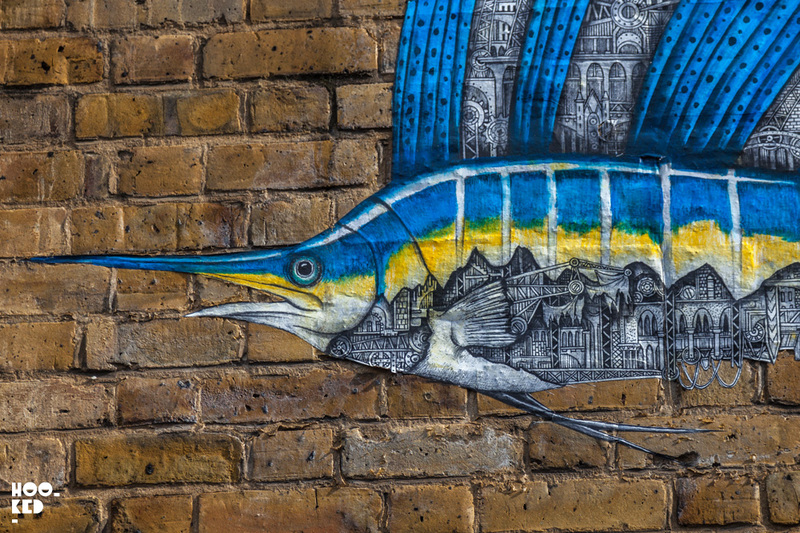 "Swordfish Mechanimal under the brick sea. . " by street artist Ardif located in the Star Yard car park just off Brick Lane, London. 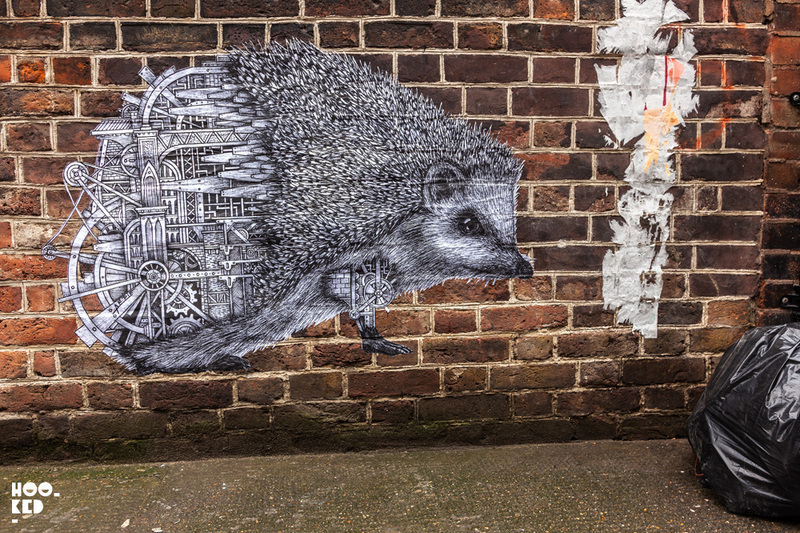 This Hedgehog mechanimal can be found on Princelet Street, London. 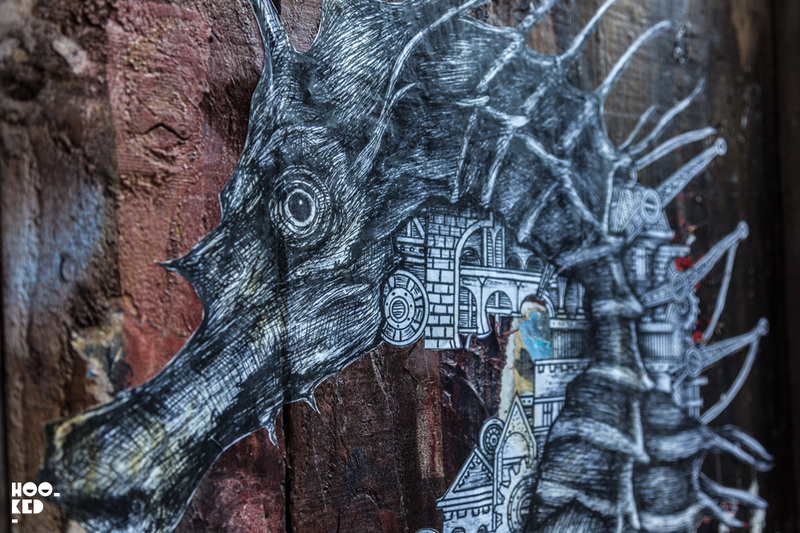 The piece above is located on Bacon Street, off Brick Lane in London. Eye-catching pasteups by Ant Carver in Brick Lane, London. Vibrant portrait pasteups by French street artist Manyoly.